Just over a year ago, Saturday Night Live lampooned President Obama for his record, or lack thereof. "There are those on the right that are angry, they think that I'm turning this great country into something that resembles the Soviet Union, or Nazi Germany," said actor Fred Armisen, portraying the President. "But, that's just not the case. Because when you look at my record it's very clear what I've done so far. And that is nothing. Nada." Armisen rattled off a checklist of Obama's unfulfilled pledges: "close Guantanamo Bay, no... Out of Iraq, nope... Improve Afghanistan, I'm pretty sure it's worse... Health Care Reform, Hell No." How a year has changed things. The headlines this week read, "Obama Bested GOP in Extraordinary Lame Duck Session" (Washington Post), "No Congress Since 1960s Makes Most Laws for Americans as 111th" (Bloomberg), "With Major Bills Passed, [Senate Majority Leader Harry] Reid Takes a Victory Lap (New York Times). As Obama put it himself at his own victorious press conference Wednesday afternoon, "I think it's fair to say that this has been the most productive post-election period we've had in decades, and it comes on the heels of the most productive two years that we've had in generations." One could argue that it was because of Congress's largely partisan productivity the past two years  passing the stimulus, health care reform and financial reregulation  that Democrats got a "shellacking," as Obama puts it, in November, losing 63 seats in the House and six Senate seats. But what is striking is how Democrats managed to shift the momentum coming out of those losses. No one expected Congress's lame duck session to be particularly productive. There were a few must pass items with pressing expiration dates, such as the Bush tax cuts and money to keep the government running next year. But instead of folding, Obama dug up his post-partisan mantle  sounding more like the man who first captured the public's imagination in 2004 with the phrase "There's not a liberal America and a conservative America  there's the United States of America" than he has in, well, years  and reached out to Republicans. Change, he discovered, is perhaps more prolific  or at least easier  when it's less one-sided. 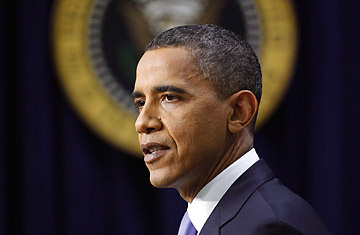 "If there's any lesson to draw from these past few weeks, it's that we are not doomed to endless gridlock," Obama said. "We've shown, in the wake of the November elections, that we have the capacity not only to make progress, but to make progress together." First, Obama made a deal with Senate Republicans to renew all of President Bush's tax cuts, including those for the wealthiest Americans, for two years, adding in an alternative minimum tax fix, unemployment insurance for millions of job seekers, and an estate tax set at 45% for estates worth $3.5 million or more. The final piece outraged progressives, though the tax package finally squeaked through the House last week. Obama and the Democrats also got through ratification of the new START Treaty, a repeal of Don't Ask Don't Tell, a $4.2 billion bill to provide health care for 9/11 first responders, a sweeping food safety bill, 19 federal judges confirmed to the bench and money to fund the federal government through March. Obama seems to have liked it so much, bipartisanship is his new mantra. In his 34-minute press conference on Wednesday he used the words "common ground" three times, the word "bipartisan" twice, the phrase "other side of the aisle" twice, "came together" three times and "across party lines" twice. Voters seem to agree: 56% of voters approved of Obama's handling of the lame duck session, compared to 42% for congressional Republicans, according to a CNN/Opinion Research poll released Wednesday. An eye-popping 59% said Obama is doing enough to cooperate with Republicans a reversal from February where more than half of respondents said he hadn't done enough. Still, Obama himself acknowledged that much remains to be done from closing the detention center at Guantanamo Bay, to immigration reform and climate change, which Obama tactfully referred to as "clean energy" in his press conference, all but acceding that passing a global warming bill with a Republican-controlled House would be next to impossible. Obama said he expected he would have a "robust debate" with Republicans early next year on "how do we cut spending that we don't need while making investments that we do need  investments in education, research and development, innovation, and the things that are essential to grow our economy over the long run, create jobs." Will this momentum last? As Obama tacks back to the center, he finds himself on lonely ground. In the past three elections, virtually all of the moderates from both sides of the aisle have been wiped out and the Tea Party, already up in arms at GOP's submission during the lame duck, will surely make negotiations more challenging when their representatives are seated in January. "This has been a capitulation in two weeks of dramatic proportions of policies that wouldn't have passed in the new Congress," Senator Lindsey Graham, a South Carolina Republican, lamented on Fox News Radio last Friday. But whether campaigning or in the lame duck, Obama has proven his capacity to surprise when expectations are lowest. See pictures of Barack Obama's college years.